Readers will remember that in December 2017 I did a series of translations and analyses of primary texts to track the dispute between Hay'at Tahrir al-Sham and al-Qaeda. This included statements from the likes of Sami al-Oraidi and Abu Humam al-Shami (who can be called 'al-Qaeda loyalists') and Abu Abdullah al-Shami (a senior member of Hay'at Tahrir al-Sham and the foremost intellectual defender of Hay'at Tahrir al-Sham's project in these disputes). 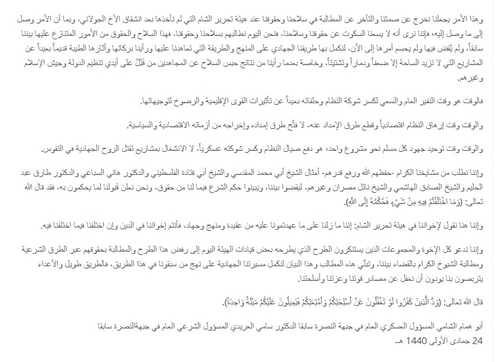 There is no reason not to continue the series when new relevant statements come to light, such as this joint statement from Sami al-Oraidi and Abu Humam al-Shami that is the focus of this post. 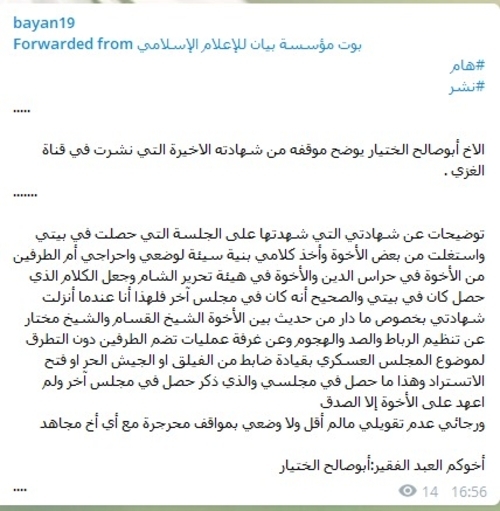 This joint statement is interesting because it accuses some unnamed leaders in Hay'at Tahrir al-Sham of suggesting the formation of a military council to be led by a defector from the Syrian military who is presently in the Free Army or (more specifically and more likely) Faylaq al-Sham, which is a faction that has been linked to the Muslim Brotherhood and has generally stayed out of infighting incidents involving Hay'at Tahrir al-Sham. In addition, these unnamed Hay'at Tahrir al-Sham leaders have apparently suggested that the organization will not oppose the reopening of the important M5 highway to the Syrian government. Below is my full translation of the statement. All parenthetical insertions in square brackets are my own. "And when you have disagreed on something, its ruling belongs to God": statement issued by the poor servant Abu Humam al-Shami the former general military official in Jabhat al-Nusra [former al-Qaeda affiliate in Syria] and Dr. Sami al-Oraidi the former general Shari'i official in Jabhat al-Nusra. "And when you have disagreed on something, its ruling belongs to God"
1. Forming a military council led by officers from the officers who have defected from the regime and joined the Free Army or Faylaq al-Sham, and most likely the Faylaq. This council will possess the decision of peace and war in the liberated areas! 2. Hay'at Tahrir al-Sham will not oppose opening the international highway for the regime. And we are surprised at this suggestion by leaders in the commission [Hay'at Tahrir al-Sham], on account of what we know about them from opinions and directives of old, and on account of negative consequences that will follow on the field and in particular in the likes of this time and these circumstances. And this matter makes us come out of our silence and the delay in demanding our weapons and rights with Hay'at Tahrir al-Sham that we have still not taken after the defection of the brother al-Jowlani [leader of Hay'at Tahrir al-Sham]. And in light of what things have come to, we believe it is not possible to be silent abut our rights and weapons. So we today demand from them our weapons and rights- for these arms and rights are among the matters we have disputed previously, and no judgement has been passed on them and their affair has not been resolved until now- in order that we may fulfil our path of jihad on the manhaj and way that we pledged and whose blessings and good effects we saw of old, far removed from the projects that only make the field weaker, more destroyed and divided. This is so especially after we saw the results of confiscating the weapons from the mujahideen previously at the hands of the Dawla organization [Islamic State] and Jaysh al-Islam [a faction that originated in East Ghouta] and others. So the time is the time for general mobilization to break the force of the regime and its allies, far from the influences of the regional forces and being subjected to their directives. And the time is the time to pressure the regime economically and cut its reinforcement lines, and not open its reinforcement lines and get it out of its economic and political crises. And the time is the time to unite the efforts of every Muslim towards one project: that is, repelling the regime's aggression and breaking its force militarily, and not to be preoccupied with projects that kill the jihadi spirit in souls. And we ask out dear mashayakh (may God protect them and raise their capability)- the likes of Sheikh Abu Muhammad al-Maqdisi [a Jordanian jihadi cleric seen as aligned with al-Qaeda and critical of Hay'at Tahrir al-Sham], Sheikh Abu Qatada al-Falastini [a figure often cited favourably by Hay'at Tahrir al-Sham leaders], and Dr. Hani al-Siba'i, Dr. Tariq Abd al-Halim, Sheikh al-Sadiq al-Hashimi, Sheikh Na'il Masran and others- to judge between us, and make clear the ruling of the law in what rights we have. And we declare our acceptance of what they rule. For God Almighty has said: "And when you have disagreed on something, its ruling belongs to God." And we say here to our brothers in Hay'at Tahrir al-Sham: we are still on what you pledged to us from doctrine, manhaj and jihad, for you are our brothers in the religion even if we have disagreed on what we have disagreed. And we call on all the brothers and groups who condemn the suggestion that some of the leaders of the commission are putting forward today to reject this suggestion and demand their rights through Shari'i means and demand the noble sheikhs to judge between us, and to adopt these demands and this statement to complete our jihadi path on the direction of those who preceded us on this path, for the path is long and the enemies lie in wait for us, wishing for us to ignore the sources of our power, honor and arms. God Almighty has said: "Those who have disbelieved have wished you to neglect your weapons and baggage so that they may come down upon you in one attack." Update (31 January 2018 CE): Amid the controversy this statement has generated, responses have come from Hay'at Tahrir al-Sham circles, such as the one below, which at least confirms there was a meeting between Hay'at Tahrir al-Sham and the al-Qaeda-loyalist faction Hurras al-Din. On Thursday, 18 Jumada al-Awal 1440 AH [24 January 2019 CE], there was a good meeting in which the Hay'at Tahrir al-Sham military leadership met with the brothers in Hurras al-Din. And the meeting lasted for a number of hours, filled with the spirit of brotherhood ,as the talk was about reinforcing the ribat [frontline manning] points and organizing military work in the liberated areas. And likewise we did not broach in the aforementioned meeting the subject of the international highways. And we were surprised in the statement issued by the brothers Abu Humam and Dr. Sami al-Oraidi that this was put to them in an official meeting with them, and as no other meeting was convened with them besides this one we make clear in this testimony the lack of truth of what was mentioned in that statement. And we ask the brother Qassam and whoso was with him in that meeting to bring forth their testimony about what happened in the meeting. For God will ask them about them. And God is the best of witnesses. This is my testimony and I am not biased towards anyone with it, but rather I only wish to say the truth and clarify the matter on the issue of the statement of our brothers of Hurras al-Din. 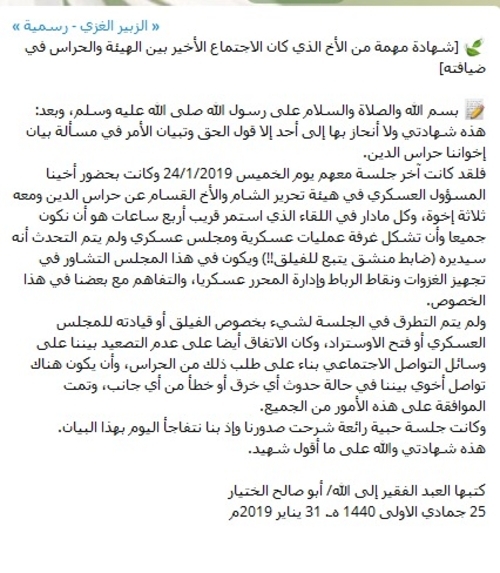 The last meeting with them was on Thursday 24 January 2019 CE and in attendance were our brother the military official in Hay'at Tahrir al-Sham and the brother al-Qassam [likely Abu Qassam al-Urduni] from Hurras al-Din and with him three brothers. And all that was discussed in the meeting that lasted some 4 hours was that we should be together and that a military operations room and military council should be formed. And there was no discussion that the one who would direct it would be a 'defecting officer affiliated with the Faylaq [Faylaq al-Sham]!!' But it was discussed that there should be mutual consultation in the council about preparing expeditions and the ribat points and administering the liberated areas militarily, and mutual understanding between us on this particular. But there was no broaching in the meeting of anything regarding the Faylaq or its command of the military council or opening the highway. And the agreement was also on not escalating between us on social media according to the request for that from Hurras, and that there should be brother contact between us in the event of the occurrence of any breaching or error from any side. And there was agreement on these matters on the part of all. And it was a great affectionate meeting that opened our hearts and so we have been surprised today by this statement. This is my testimony and God is witness to what I say. 25 Jumada al-Awal 1440 AH, corresponding to 31 January 2019 CE. "Clarifications about my testimony to which I bore witness regarding the meeting that occurred in my house as it has been exploited by some of the brothers and my words taken with ill intent towards my position and jeopardize me before the two sides from the brothers in Hurras al-Din and the brothers in Hay'at Tahrir al-Sham, and making the words that occurred as though they were in my house. And the truth is that they were in another meeting. Therefore, when I published my testimony regarding the talk that occurred between the brothers Sheikh al-Qassam and Sheikh Mukhtar about organizing the ribat and resisting and attacking and about an operations room including the two sides without broaching the subject of the military council led by an officer from al-Faylaq or the Free Army or opening the highway: this is what occurred in my meeting and what was mentioned occurred in another meeting and I have only heeded truthfulness for the brothers. Your brother the poor servant: Abu Saleh al-Khatyar"